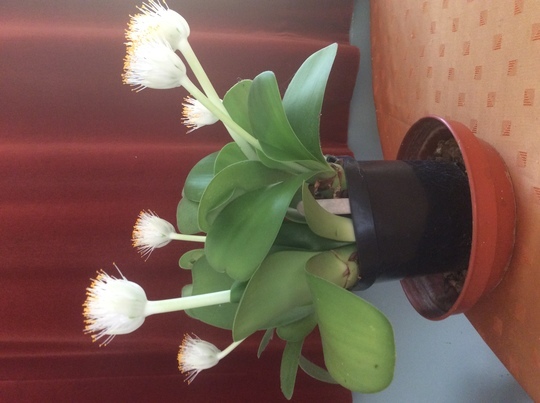 This is the Shaving brush plant (Haemanthus Alba)we had in one of our old greenhouses. It’s doing quite well in the new greenhouse, as you can see. Can you recommend another colour? Do you know the name of a good supplier, please? I’d like to get some for my Other Half. Any color you choose will be stunning. I like them all. 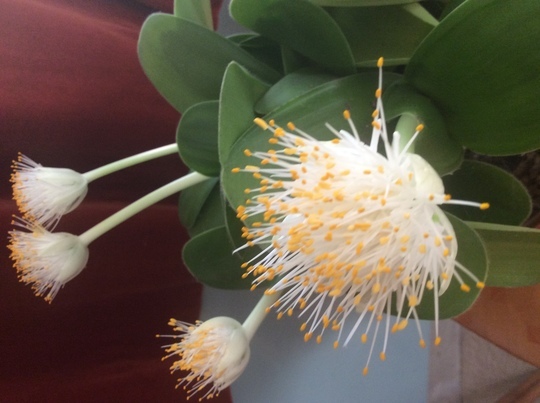 It's stunning and Iove white flowers. I also like the blood one to. Fascinating plant, never seen one before. It's a cute plant to have in the house. The blood one is really stunning. Haven't been able to find a supplier anywhere. Thanks for the link Thrupennybit. The Australian growers supply only certain states in their own country ; not Internationally. The Thailand site has sent bulbs but these have not been allowed into the buyer's country! Some of the prices are very high and to be refused "admittance" must add insult to injury. Thought the Dutch growers would be able to help. Apologies for the images facing the wrong way. Not sure how that happened! I love this plant , at the moment it is spring and we still have lots of flowers .... you will see this every now again when we driving , temperatures has only really started to go up last week so we had some extra autumn/winter plants growing with the spring plants but it's reaching the 34°c today , so doubt these plants will be around anymore .... the flower reminds me a lot of a Protea flower though , such stunning plants ! If a visitor was going to Australia would they be allowed to bring them back into this country ? I do recall getting in touch with the powers that be regarding a plant I "imported" from France. Had a really helpful reply and all was well. Not sure about plants from further afield. Thank Goodness for the Web: at least one can find an answer if one asks the right question! One has to be so careful these days as we can bring in pests and diseases we really don't want! Having a plant imported through someone is one thing but bringing it back with you on a flight from another country is another thing all together . I would suggest you give your local airport customs a call and see what they say, you don't want to bring a beloved prized plant home to have it incinerated at the airport . At most airports you are not allowed to bring any plant matter , fresh, dried or cooked through customs. Thanks for that, Brentsa and Thrupennybit. It is surprising how many people try to export and import plants and food. It's always best to check. Look forward to February when a UK supplier will be getting us some bulbs. Don't even think of bring plants through JFK, they even took my raspberry jam, which was gift wrapped. They are right, though. The world is a small "place" these days!